ISLAMABAD, Paksitan (CNN) -- Pakistani military jets bombed Taliban militant hideouts Tuesday in the country's lawless tribal region, a senior military official told CNN. 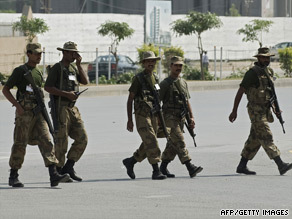 Soldiers march at army HQ in Rawalpindi Tuesday, three days after militants took dozens of hostages in a siege. The jet fighters struck Taliban hideouts in the villages of Makeen and Ladha in South Waziristan, the official said. Pakistani soldiers stationed at nearby military posts also fired on the hideouts, the official said. Pakistani military jets also launched airstrikes on militant hideouts in Bajaur Agency, the northern-most district in Pakistan's tribal region located along the Afghan border. The villages in South Waziristan are strongholds of the late Pakistani Taliban leader Baitullah Mehsud who was killed in a U.S. drone strike in August, the official said. The Pakistani Taliban are now led by Hakimullah Mehsud. Pakistan's military blamed the Taliban in South Waziristan for Saturday's militant attack on the army's headquarters in Rawalpindi. Five militants held dozens of hostages inside the army headquarters for some 22 hours. Eleven military personnel, three civilians, and nine militants were killed in the siege. The Pakistani military has been targeting militant hideouts in South Waziristan over the past month, sealing access to the region in preparation for a major ground offensive, military spokesman Gen. Athar Abbas told CNN last week. Both government and military officials say the offensive is coming soon but have yet to announce a date. Fearing the impending ground offensive in South Waziristan, civilians have fled en masse from South Waziristan to the adjacent districts of Tank and Dera Ismail Khan, the senior military official said.